Robert Higgs, Depression, War, and Cold War: Studies in Political Economy (New York: Oxford, 2006), 221 pp. Robert Higgs, a Senior Fellow at the Independent Institute, is a depressing fellow. Not in person  Bob is animated, interesting, and challenging, and makes a wonderful dinner partner and conference participant. But the natural consequence of reading his work is profound depression. An economic historian, he excels at publicizing data other academics ignore. Through it we see why Thomas Jefferson presciently warned that the natural tendency of liberty is to give way. Depressing though Higgs’s conclusions often are, understanding them is necessary for citizens to defend their freedom. Unfortunately, as is evident in Depression, War, and Cold War, the manifold deceptions and misperceptions common to the political marketplace invariably enhance the ability of public officials to expand their power at public expense. Higgs’ latest effort is a collection of essays on the economics of war. Unsurprisingly, he finds that any conflict, whether hot or cold, puts economic liberty at risk. That, in turn, threatens personal freedom and economic prosperity. "I do not now, and never did before, suppose the Soviet regime to have been a benign one in any respect. Ronald Reagan spoke a simple truth when he called it an “evil empire.” To recognize the nasty character of the Soviet regime, however, hardly settles where responsibility lay for the various dimensions of the Cold War, especially for the arms races that formed its core process, creating grave threats to humanity and causing technological and economic distortions that severely damaged the US economy and utterly doomed the backward, inherently ill-fated Soviet command economy. Moreover, if the Soviet government did the devil’s work, so, on many occasions, did the US government and its allies. Not the least of the self-damage was the transformation of the executive branch of the federal government into a secretive, highly discretionary, often ill-advised, and badly informed organization that was far too dedicated to attempting the futile task of running the whole world." But the purpose of Depression, War, and Cold War is not to refight relative responsibility for one or another episode of the Cold War. Rather, it is to assess the economic behavior of government, and the economic consequences of that behavior, in conflict. Higgs begins by challenging the conventional wisdom about the Great Depression: why it lasted so long, whether it ended during the war, and why prosperity returned when peace was restored. He focuses on private investment, which, he contends, explains the fortunes of the US economy. Particularly interesting is Higgs’s argument that private investment remained low out of fear over the security of capital and profit. Far from “saving capitalism from itself,” Franklin Delano Roosevelt inhibited an economic recovery by experimenting with all manner of government controls and regulations. Higgs launches a related and equally fearless assault on the conventional wisdom in reassessing the performance of the economy during World War II. It is commonly claimed that participation in the greatest slaughter of human history, along with the most wasteful production of goods which destroy rather than enrich, created prosperity. Of course, anyone with a skeptical eye always had to wonder: if that’s true, then couldn’t the government have attained the same end with far less hardship years before by simply printing up the same amount of money with which to pay people as if they were soldiers and companies as if they were defense contractors? It should have been far easier to spend one’s way to prosperity without a global conflagration. Higgs offers a consistent explanation of the return to prosperity after the war. He dismisses what he calls the “orthodox account,” that essentially people were finally able to spend their forced savings from the war, forestalling the depression that many people feared would return. By actually looking at the data  what a novel approach!  Higgs finds that people “did not reduce their holdings of liquid assets.” From what did the postwar recovery spring? Writes Higgs: “The answer is, in nominal terms, by a combination of increased personal income and a reduced rate of savings; in real terms, simply by reducing the rate of personal savings.” Private investment had a somewhat different source  sale of government securities, increased retained earnings (aided by a drop in corporate taxes), and surge in stock and bond offerings. Of course, the end of the very hot World War II did not end the impact of military policy on the economy. Higgs devotes a chapter to the Cold War, particularly the role of defense spending, the government’s most direct impact on economic activity. "The national security elite’s close hold on critical information would not have been particularly noteworthy if the interests of the elite and the interests of the public had corresponded closely. But nothing in the workings of US political institutions ensured that a close correspondence would always exist, and abundant historical evidence shows that it frequently did not. Plainly, leaders of the defense elite had interests of their own  personal, political, institutional, material, and ideological  interests that they could serve through strategic retention, dissemination, or misrepresentation of the information to which they alone had access." In Depression, War, and Cold War Higgs goes on to devote substantial attention to the activities of the national security elite through military procurement. One of his most valuable contributions is his review of how World War II created the antecedents to the current system. It is hard to imagine today, after more than 60 years of hot and cold conflicts, but the US once had a limited international role and avoided war. Notes Higgs, “Before 1940, everything about military procurement was different.” The government didn’t buy much hardware. Contracts were awarded through competitive bids. Many businesses consciously avoided military work. The public giveaway continues. Higgs assessed the defense industry, and found that “For the period 1970-89 as a whole, by every measure, the top defense firms outperformed the market by a huge margin.” At the same time, “The claim that investment in defense companies was riskier than investment in the overall market is not compelling.” He emphasizes that this result alone does not mean that profits are “too high” in a normative sense, but it does raise questions about the accuracy of conventional measurements of rates of return and risk. In fact, the primary abuses almost always come from politicians. Higgs devotes an entire chapter to the case of anthracite coal, which the US for years shipped from America to coal-rich Germany for use by American military forces stationed there. He spends another chapter covering airplanes that the Pentagon doesn’t want but Congress insists be purchased. In such cases Americans suffer a double whammy: wasted tax dollars and degraded defense capabilities. What is the answer? Ultimately, change public opinion. Higgs concludes his compelling book with a review of the impact of popular attitudes on defense outlays. He and chapter co-author Anthony Kilduff write: “The research findings that we report here show that with a simple statistical model, one can explain a high proportion of the variance of the annual rate of change of US defense outlays from the mid-1960s through the 1980s.” It’s a fascinating example of how, despite all of the imperfections of the political process, public policy can be responsive to public attitudes. Nevertheless, Higgs and Kilduff offer a warning that is as valuable as it is sobering. Public opinion itself is not simply the result of a disinterested and knowledgeable citizenry getting involved in issues. Rather, “There occurs a ceaseless contest over the determination of public opinion, and in this contest, defense policymakers, whose preferences may differ from those of the mass public, occupy a powerful position.” As a result, Higgs and Kilduff warn, “we remain uncertain of the extent to which public opinion about defense spending was independent of the desires of government officials and, therefore, may be viewed as an important autonomous determinant of spending decisions.” In short, it’s hard to know if the citizens are telling the politicians what the citizens want, or what the politicians want the citizens to want. 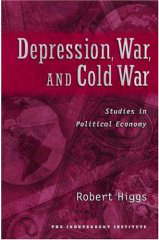 Depression, War, and Cold War offers precisely what readers have come to expect from Robert Higgs: detailed research, solid references, cogent analysis, and sharp opinions. Reading his latest book demonstrates yet again how difficult it is for Americans to defend the constitutional republic bequeathed by the founders. But reading Higgs’s latest book simultaneously helps equip us to do battle to preserve our constitutional republic.